Our company was founded in the year 2010. We have served thousands of satisfied customers. Check out some of they're comments below. "Love the Cashew Cheese...keep up the good work!" "Here's a couple of omelet ideas. Choose the Cashew Reserve product that sounds good for breakfast or as a dinner entree ( we have a collection of flavors) and either mix it in with the eggs before cooking or spread it on top after plating. They're all good. Thanks for being there Cultured Kitchen." "U guys are amazing this cashew cheese has been literally sustaining me and g/f for months. Thank u ‪#‎happilyaddicted‬"
"Great meeting you guys SacTown VegFest. That was some tasty stuff "
"Wow. Pepper Jack Cashew Cheese. I put some on my vegan red lintels. That is some amazing cheese. So a new fan!" and when bagel season hits = your cashew cheezes"
‪"#‎Morselicious‬ ly ‪#‎excited‬ to discover you and taste your ‪#‎AMAZING‬ ‪#‎glutenfree‬ ‪#‎real‬ ‪#‎food‬! Do you have a physical store?" -Alexander J. Dita I though it was going to be gone forever! -TheLiving Bo Blasphemy Alexander! Prophesy has always predicted the death and resurrection of our savior Cheesus Christ"
"Omg.....so exciting! I cant get to farmers market as often as I'd like. I'm so glad......more cashew cheese please!" "So good! My very favorite!" "I miss this cheese. Hands down best vegan cheese I have ever had. The west coast gets everything good." "Love your foods! The cashew reserves are de-lish!" "OMG the Herbs and Chives Cashew spread is insanely delicious. Happy to find at Whole Foods! Can't wait to try your other products. #Vegan #DairyFree #ILoveNuts." "LIVING for this cashew cheese from @theculturedkitchensac 😜 Thank you @jmohello for the recommendation 🌱🧀 and thanks @wholefoods for supplying my cheese fix 🎉"
"I'm so excited! I have been having my friends in Santa Cruz bring me The Cultured Kitchen cashew cheese when they visit and I was planning a trip down to Chico to buy some. I requested that the Holiday on Shasta View carry it and they did! It is cultured, like cow cheese, so it doesn't taste nasty like most vegan cheese. I want them to continue to stock it, so Redding vegans and vegan curious, please buy it and enjoy!" "Hi, folks! Am enjoying your products, especially the cashew cheese, smoky-style." "Hello, I found your Plain & Garlic/Chive Betta Buttah @ Sac Foods Co-Op 2 weeks ago & am in LOVE!!" "I just tried your cheese last night and it was amazing!!!!" "The Cashew Cheese products are terrific. We've gotten four of them and they're all great. " "You have no idea how stoked I was to see this back on the shelves. Welcome back!! Bought two "
"Will the cashew cheeses be available nation wide at any point? I used to buy them in San Francisco....I've moved and I'm hoping they'll show up at the Whole Foods in Overland Park, KS someday.... "
"Oh, thank god you're back!!!!!" "omg! this makes me so happy! I seriously look everytime I go to the sac, davis or gv co op. This is a happy day :)"
"Can't wait!!!! I shop at Florin, hope I can find it there too, your ranch dressing is my favorite ever but cheese choices there are good too!" "Just tried your white cheddar for the first time and I am IN LOVE! Can't wait to try more =]"
"Tried the Cultured Kitchen's Cashew Cheese tonight - SO SO good. Perfect for those of us that are dairy and gluten free!" 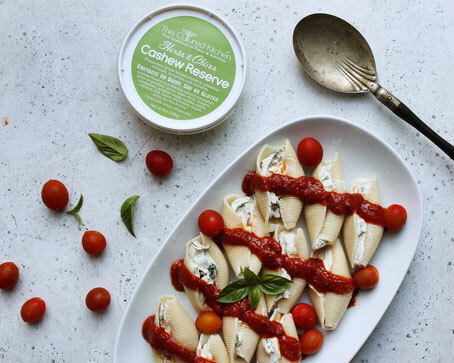 "Love the Pesto Cashew Reserve. I've tried your products before through a friend, but I just committed and bought some myself... I'm hooked. I feel like I could eat this is some sort of fashion EVERY DAY. Being Gluten and Dairy Free for 6+ years I've tried a lot of products. This is by far the best. YUM. Well done. I can not wait to try all the flavors. Thank you for making food taste good." "OMG!! I just tried the Betta Buttah, it's delish!!!! It melts fabulous and tastes great!!! I have the garlic and chive. Yum Yum Yum!!!!" "I am sooooo in love with your cashew cheese and Betta Butta! Cheese and butter were the last two staples that kept me from going vegan, so a huge Thank You for making it easier!! 😊✌🏾️"
"White cheddar cashew cheese! phenomenal!" "Oh my gosh! I just tried your basil pesto cashew cheese for the first time. It is amazing!!! It is so much like the soft herbed cream cheese I used to love when I was a kid, but it's vegan and soy-free! Thank you!!!!!!!!" "The habanero cilantro lime Cashew Cheese is the perfect substitute for sour cream!" And Kimchi, and pickled veggies oh my. You have the best products EVER!" "I absolutely love your products. Thank you for creating delicious, nourishing food I can recommend to people!!! Keep it up!." "Picked up your herb and pepper jack cashew cheese at the sunrise farmers market this morning and I LOVE it!! "I looooove that stuff especially the herb flavor!" "Missed you the last few weeks at Carmichael Park Farmers Market - Understand that you havent been there for a while. Where else close to Carmichael can we find you -specifically the better buttah -garlic chive...?" Kairis Joy DoulaNheels Chiaji "Indebted for life!!! That cashew pepper jack is everything!" "Lol it's good stuff. They also sell it out at the co-op. Haven't found it in Elk Grove, if you get some bring a tub back for your friends!" "My husband and I were blown away by the quality they put into their products. Our favorites are the Herbs&Chive Cashew Cheese and the Live Coconut Yogurt. That Cashew Cheese tho is the best, my husband and I fight over who gets the last bites of it every single time we get it." The cultured kitchen is my favorite! They have tons of products. They are even in KP Market now for way cheaper, and farmers market is cheaper.